This news comes from my friends at GottabeMobile, it's a new... a new... well, a new subnotebook from HP. There is not any way we can call this a UMPC when it does not have a touch screen, it has a 8.9 inches display and the Specs say that its weight is... more than 5 pounds! With prices listed from $549 - $849, there's a pretty large range of affordability. The $849 version may be an anomaly - it's listed as "Regional" and at a price higher than the Vista Business model with more RAM. JKonTheRun just posted a very good video showing how this task needs to be done to end with a still alive Q1U! First of all, always keep in mind that by doing that you may be violating the Warranty in that device, second of all, this upgrade is not something that I would recommend to everybody unless your name is Kevin Tofel. This year is going to be the year of MID (Mobile Internet Devices). A good sign of that is this new MID released by Sharp in Japan. 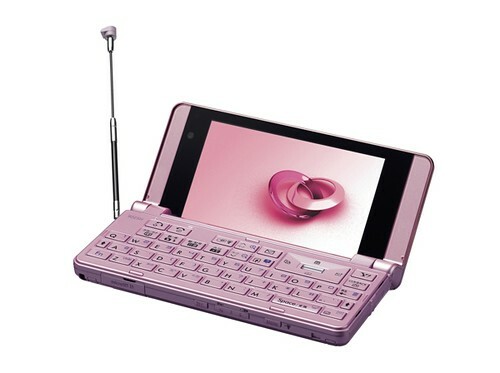 Sharp launches its 3G mobile phone '922SH' in Japan market through SoftBank, which is expected to be available on 28th March. Oh, wait a minute... I forgot my opinion... Well, I don't know but the antenna seems to me a little bit "retro"... Do not you think? 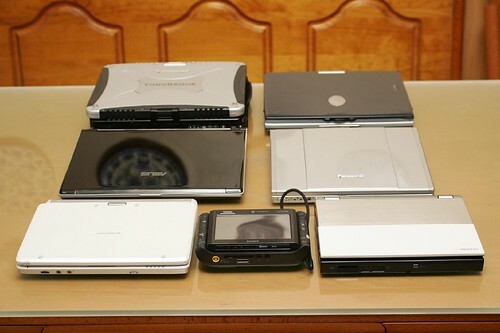 Typhoon Touch is accusing Tabletkiosk and other Tablet PC makers of patent violations according to a news published at CNET News. I have been in contact with Tabletkiosk in the last - almost already- two years many times for many reasons, and even on those moments where I have been "rude" and virtually a "pain in the neck" I always have found in them a great level of professionalism and honesty. Two virtues hard to find now days. Yesterday my Kindle was updated automatically by Amazon to version 1.04. I have not noticed anything new or different. But I have to say that I'm extremely happy to see an update process so well thought. I left my Kindle in standby in my bed and went to our kitchen to drink a glass of water, and when I came back I noticed that there was a different standby picture shown on it, I exited the standby mode, checked the version number and there it was a new version. Do you want something simpler than that? Would you like to see some very good pictures of the Kohjinsha SH8 UMPC and to find out how big is compared to many other mobile pcs in the market? Check this link. Matt Miller is a well know person in our community and that makes his opinion, even for persons like me that do not like the Shift and think that HTC has chosen a really bad moment to release this already semi obsolete device to the market, a really valuable opinion that is worth to read. I’ve been using an HTC Shift from Sprint for over a week now and as you can see in the more than 140 photos and screenshots found in my image gallery and quick and dirty post yesterday I have had a chance to try out most all aspects of the device. As I said yesterday, I was planning to post my full review next Monday, 24 March, but Amazon posted a pre-order page of the device. 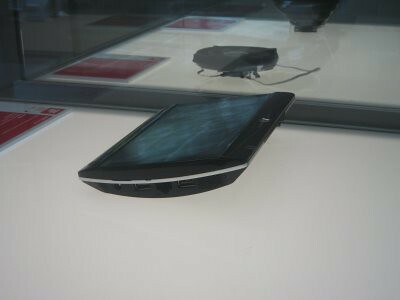 The HTC Shift from Sprint has a model designation of HTC X9000 and a suggested retail price of US$1,499. And said semi obsolete because this device is using a processor A110 well know for it poor performance compare to the old Pentium M, Celeron M and Core Solo processors. But thinking a lot deeper, after seeing the next generation called Atom which has even a poorer performance may be the decision of using the A110 is not that bad after all. Anyway... The HTC Shift with a Core Solo would had became the dream machine of many members of the UMPC community. If you are looking for a rugged small tablet be here is a review that you should not miss under any circumstance. This go anywhere, do anything Tablet PC makes me re think my decision not to have a rugged Tablet pc as part of my everyday Tablet arsenal. In fact the screen alone makes this Tablet Pc worth owning for anyone who likes or needs to use their computer outside in sun. That's the news published today at Windows Vista Team Blog. Today, you can now download Windows Vista SP1 via Windows Update. For those of you eager to receive the benefits of Windows Vista SP1 - you can now do so! We've seen quite a bit of questions in our comments so we want to communicate as much as possible surrounding Windows Vista SP1 and today's release to Windows Update as we can. SP1 will start downloading to PCs automatically beginning in mid-April (Remember, this happens only if you have your Windows Update configured to automatically download updates and SP1 will automatically download but not automatically install). But if you want to get the benefit of a year's worth of improvements right now, go check Windows Update today...(Hit the Start Menu, All Programs, and select Windows Update). I installed a few weeks ago in my Samsung Q1 and I felt the difference, I wont say that you should expect miracles but it helps. So far, I have not had any problems or issues so far. This weekend it was brought to my attention an article published at El Semanal Digital where my name is mentioned. The article is about how you can get tech support in your home computer - in this article a computer located in Spain- from a source located 1000 of miles away - in this case in Florida, USA. All that thanks to a little program called Crossloop. This tool is based in another very popular tool within the IT guys called VNC Viewer. In both cases these are programs that allows you to access a remote computer from your own one and work on it. In the above mentioned article the author was talking about his experiences with a tech support service that I have for my readers in Spain. In my career as IT Manager I have been using this and other tools to help remotely my clients but Crossloop is one of the best when you want to bring that feeling of security to a customer that will give you access to his personal computer. Using Crossloop you only gain access to the remote computer if the customer gives you an authorization number that you have to retype on your end to get access. On top of that, the customer has to authorize the access in his end. In few words, a safe way to get help from any where in the World. The Intel Core Solo used in the Q1U Premium runs at 1.33 GHz, has a 533MHz front side bus speed and includes 2 MB of L2 cache memory on the chip. The Intel A110 CPU used in the Q1U devices run at either 600- or 800 MHz, have a 400 MHz front side bus speed and include only 512 KB of L2 cache. Since we're chatting about CPUs, it's probably worth a mention that the new Intel Atom CPUs will run at up to 1.8 GHz on only 2.5 Watts. My understanding is that will have the faster 533 MHz front side bus like the Core Solo, but only 512 KB of cache like the A110. ...I'll be keeping the device. In fact, I just ordered a second 6-cell battery and a 2 GB RAM stick. The battery was around $98 and the RAM was $55. Combined, they'll boost my productivity by turning this UMPC into an all day device. Another powerful user who has changed his old Everun for the Q1U Premium is Steve from UMPC Portal. With the Core Solo processor and the extended battery it was in a different league to my own Q1 Ultra and seeing the smooth video capabilities made me think about giving my Q1 Ultra a second try with an XP installation. The second thing that happened was that I hit the limit of the Everun's processing capabilities quite a few times at CeBIT. Simultaneous live blogging, photo capture and photo editing was too much for the Everun despite my attempts to be patient and efficient. There's no doubt that, despite its portability and suitability for browser-based work, it reduced my productivity in certain situations. So here you go. Two cases and in both you have a common issue PRODUCTIVITY something that to me translates in another word: performance. WE NEED PERFORMANCE INTEL. That's what we need. And once again, it seems to me that VIA will win this race if Intel keeps giving MID all the priority. Update: Steve is given his Q1U a Second Chance. I though that he bought a Q1U Premium, Sorry Steve! That's what is promising the Taiwanese company Netronix according to a news posted today at Gizmodo. Taiwanese manufacturer Netronix is promising a new spin on an old idea: putting a touchscreen on an the EB-100, an E-Ink-based e-book reader. WiFi does not look appealing anymore after being using the Amazon Kindle. Touchscreen, could be a plus, but at what price? I don't think that another iLiad is needed at all. An XDA-developers user has found a way to access the C Drive from "WM6" and also install any program in that cut down version of WM6 installed in the HTC Shift. I have managed to almost access Windows Vista from the Windows Mobile side. Well, at least that's my opinion after analyzing two years of fiascos coming from Intel. Last year was completely lost because the best that Intel could release was the A110 and A100, two processors that did not give a extra battery life worth to mention because we have plenty of examples of other UMPC using even Core Solo with about the same battery life. The A110 and A100 performance was about the same than what we see in the second generation of VIA processors. Now Intel just released the Atom. And what we have there, lets check this chart posted at JKonTheRun. Once again the new processor from Intel specially designed for UMPC and MID performs worse than the old Celeron M at 900 MHz. 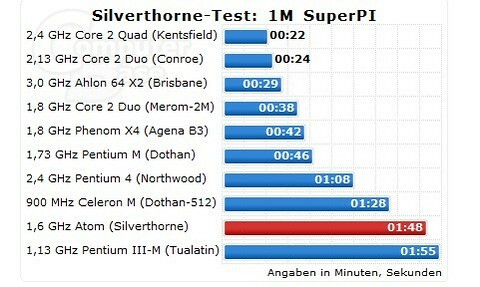 There are even few reports about A110 processors out performing this Atom score. So for two years on the road Intel has not been able to release a better processor from the point of view of performance and there are some reports that the Atom even does not support Aero in Vista. If you compare this to what is going on with VIA processors you will see a different picture there. 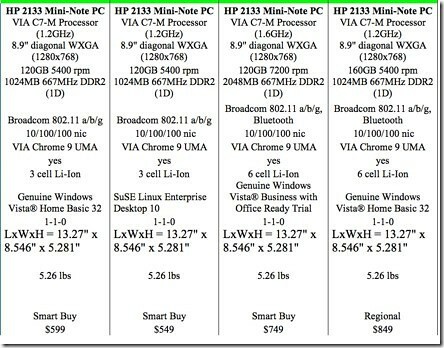 VIA has upgraded its processors for UMPC two times in the same period and in both cases we have seen a gain in performance and battery life. So, who is winning this battle? Evidently VIA. VIA processor still do not out perform in some cases the A110 and Atom processors in performance but if they continue doing what they have been doing I wont be surprised to see a faster VIA processor before this year ends. 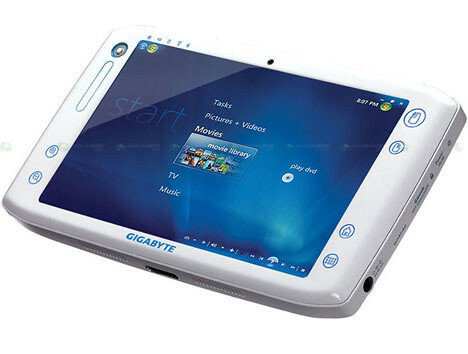 Engadget has just posted some real pictures of the M700 from Gigabyte. With 2 GB and that 1,2 VIA processor this device is a fair competitor for the latest FIASCO of Intel called Atom which performance is a lot worse than a Celeron M at 900 MHz according to the latest numbers that I have in my hands. The M700 (pictured) is a tad more ambitious, with a VIA C7-M 1.2GHz processor, Windows Vista Home Premium, 2GB of RAM, a 1.8-inch 40GB / 60GB HDD and a 1024 x 600 7-inch touchscreen. There's no hardware keyboard, but you can type via a UMPC-style software keyboard, and real kicker here is a dock for the computer that lets the M700 power a desktop setup, complete with disc drive. No word on price or release date for either of these. Overclocking Q1U INTEL A110, DONE! That's the title of a new thread at Origami Project Forum. The A110 processor has been finally overclocked by sosftware. Download SETFBS from here and select the CV174CPAG PLL from dropdown list and hit the GET FBS button. There you go, you can now overclock your Samsung Q1U. Seen how the cooling setup reacts to 10% overclock of FBS and DDR, it seems there isn`t much room for overcloking due to heat tolerance. It seems to do ok up to 15% increase (917,8MHz CPU and 458,9MHz FBS), but I haven`t had the unit for long enough to be willing to kill it so soon. Have not played with the PCI and PCI-E BUS speed yet, don´t see the point (i don`t play games on my Q1U). I tried that software a while back in my Q1 with Celeron M and it did not work... so... it's time to download the latest version and try it again. The guys in charge of materializing all this project were Pro Software. Wow, this is a really good looking design and technically is not bad at all. 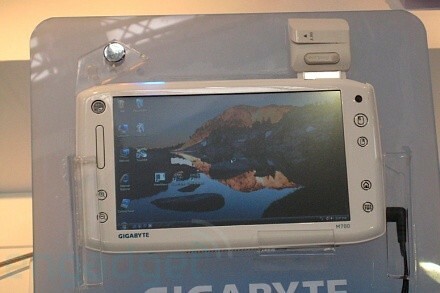 Just unveiled at CeBit, Gigabyte's M700 UMPC comes with a surprising 2 GB RAM. In addition to its hefty memory and bright design, the M700 manages to pack in a 7-inch, 1024x600 touchscreen and a 1.2 GHz Via C7-M processor. It also has Windows Vista Home Premium. Details on pricing and release are hush hush at this point. Steve and JKK keep informing the whole community from CeBit 2008. Here is their latest video, this time about the Gigabyte M528. Is not this one of the weirdest UMPC picture that you have seen? More pictures right from CeBit 2008 at JKKMobile. Today Intel officially announced the new line of mobile processors Atom and Today we have received already the first reports coming from CeBit thanks to Steve "Chippy" from UMPCPortal. The new Atom is nothing more than another Intel Fiasco as bad as the A110 and A100 currently used in some UMPC. At least those were supporting Vista Aero thanks to the 945 chipset. No-one stopped me from having a good play around with the R70a though. Smaller and much better looking than the R2H/E, its running Vista in typical UMPC fashion (slow) on a 1.6Ghz CPU that I assume is Atom. If the predictions are right, a 1.6Ghz Atom will be about as fast as a Celeron 900 which isn't nearly enough. There's no aero capability either. Chippy is doing a wonderful job reporting from CeBit. Stay turned because tomorrow he will be talking about Gigabyte's latest UMPC.